(Nanowerk News) It's technology so advanced that the machine capable of using it doesn't yet exist. This kind of "hypermodal" imaging -- if it came to fruition -- would give doctors a much clearer picture of patients' organs and tissues than a single method alone could provide. It could help medical professionals diagnose disease and identify the boundaries of tumors. "This nanoparticle may open the door for new 'hypermodal' imaging systems that allow a lot of new information to be obtained using just one contrast agent," says researcher Jonathan Lovell, PhD, UB assistant professor of biomedical engineering. "Once such systems are developed, a patient could theoretically go in for one scan with one machine instead of multiple scans with multiple machines." Differences like these mean doctors can get a much clearer picture of what's happening inside the body by merging the results of multiple modalities. A machine capable of performing all six imaging techniques at once has not yet been invented, to Lovell's knowledge, but he and his coauthors hope that discoveries like theirs will spur development of such technology. 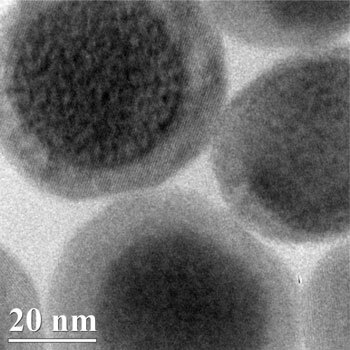 The research, "Hexamodal Imaging with Porphyrin-Phospholipid-Coated Upconversion Nanoparticles", was published online Jan. 14 in the journal Advanced Materials. It was led by Lovell; Paras Prasad, PhD, executive director of UB's Institute for Lasers, Photonics and Biophotonics (ILPB); and Guanying Chen, PhD, a researcher at ILPB and Harbin Institute of Technology in China. The team also included additionanl collaborators from these institutions, as well as the University of Wisconsin and POSTECH in South Korea. The researchers designed the nanoparticles from two components: An "upconversion" core that glows blue when struck by near-infrared light, and an outer fabric of porphyrin-phospholipids (PoP) that wraps around the core. The core, initially designed for upconversion imaging, is made from sodium, ytterbium, fluorine, yttrium and thulium. The ytterbium is dense in electrons -- a property that facilitates detection by CT scans. "Combining these two biocompatible components into a single nanoparticle could give tomorrow's doctors a powerful, new tool for medical imaging," says Prasad, also a SUNY Distinguished Professor of chemistry, physics, medicine and electrical engineering at UB. "More studies would have to be done to determine whether the nanoparticle is safe to use for such purposes, but it does not contain toxic metals such as cadmium that are known to pose potential risks and found in some other nanoparticles." "Another advantage of this core/shell imaging contrast agent is that it could enable biomedical imaging at multiple scales, from single-molecule to cell imaging, as well as from vascular and organ imaging to whole-body bioimaging," Chen adds. "These broad, potential capabilities are due to a plurality of optical, photoacoustic and radionuclide imaging abilities that the agent possesses."